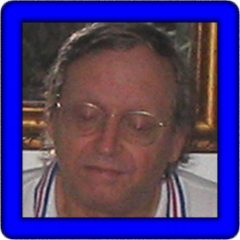 (January 2005) My name is Johannes "John" Vishnoff and I was born in 1945 in Nijmegen, The Netherlands, not to far from a "bridge too far." I am now living in Ibague, Colombia and have been retired for over two years. I am married with Rocio and we have three grown up children, all like father, with no musical affinity. I am a medical doctor, an anesthesiologist, and have been living in Colombia now for over 40 years. I retired from the Colombian Social Security but am still active with my private practice, and yes, with more time to spend at the keyboard. Musical Background: My musical background is Null, the only thing I can remember is my mother singing in the kitchen while cooking for the family (and she still does). At the age of 15, for my birthday, I was given an acoustic guitar and started learning the basic chords and singing old German, Dutch and country songs along with my grandparents, family and friends. One year later we moved to Colombia and here there was no place for those songs. So I learned then the Boleros and Rancheras (Mariachis) and played with friends at home, specially during parties and after a few drinks! Before I retired, my wife gave me a PSR-2000 keyboard, (which I changed at the black-market for a 2100 and, now, the 3000), so I wouldn't get bored spending so much time at home and she was right! As with the guitar, I began learning the chords and listening to the different styles and started singing along while playing the left hand (chords) only. I soon realized that with the guitar I played to the tempo of my voice (song), but here you had to sing to the tempo of the keyboard. Learning to read music and playing the right hand became priority number one! 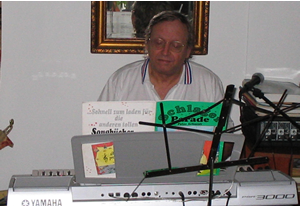 Then, for me, a miracle happened, I found Joe Waters' PSR Tutorial page, and started learning more about music, chords, combination of voices, multi-pads, counting the tempos, the keyboard itself, etc and listening to all those magnificent performers. So thank you Joe and PSR Performers, you have all been teachers (maestros) to me. Special thanks to Del and Ton who encouraged me to keep going on, for the advice and their patience. I am a beginner (rookie), having fun while learning and playing for myself, comments and advice are always welcome. My dad used to say "one is never too old to learn!" P.S. For those who love Golf and Amateur Radio, my handicap is 18 and my call HK6HFY. 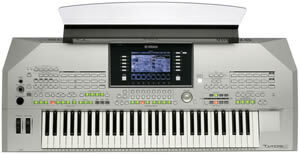 Note: in November 2008, John moved on to the Tyros2 and then in January 2011 he purchased the Tyros4. John has provided100 songs in midi format. These were created on the PSR-3000 (3k) or the Tyros2 (T2). Individual songs are shown in the table below and any one song can be downloaded by right-clicking on the song link. You can download all of John's MIDI songs here: JV-3k.zip. The table displays the song title, tempo (T), time signature (TS), lyrics (L), chords (C), where possible, the style used, the original volume (V), and the keyboard used (K). John's songs are arranged alphabetically by keyboard. Click on the song title to listen to and/or download the song.